Description: NS 143 runs early on this Tuesday afternoon. Description: NS 143 is early on this sunny and warm Tuesday afternoon. Description: NS 174 is northbound on the Marion Branch at MP-79. Description: NS 173 rolls upgrade at Five Row with an awesome lashup. Description: N/B m.t. coal at S. Tasso. Description: NS train 321 at Crawford, FL on the GS&F district. 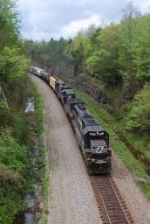 Description: A UP SD70M leads an NS SD60 EB with a manifest. Description: A look at the NS Juniata Shops. Description: Note on the flatcar "the Spirit of CR" shell getting readied for the paint shop.